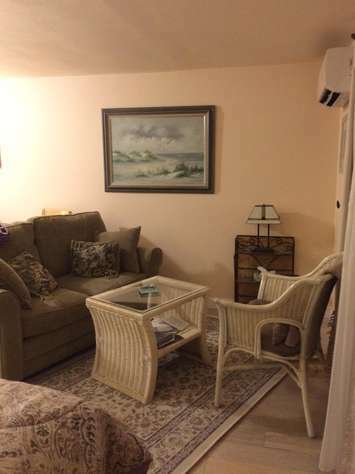 Vacation Rentals | The Braemar Condominium Vacation Rentals"
Relax in our comfortable recently renovated efficiency condominium. This ground floor unit has wood flooring, sliders to deck and grassy picnic BBQ area, A/C, heat, color cable TV and bathroom with shower. This unit has a queen-size bed. It is equipped with linens and cooking utensils. Fresh towels are available. Please bring towels for the beach and pool. 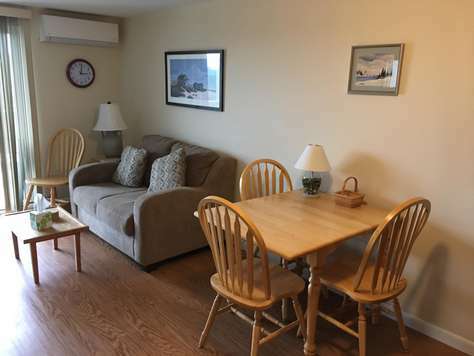 Enjoy a quiet and relaxing vacation escape in this clean, cool, and comfortable ground floor efficiency in North Truro. Recently remodeled, this unit has heat and A/C, new wall-to-wall carpeting, a full bath with tub/shower, and sliders to a private deck. The updated kitchen area includes a new frost-free refrigerator/freezer, microwave, coffee maker, toaster, blender, cookware, and utensils. For your added enjoyment and convenience, the unit is also equipped with a flat screen TV, DVD player, FM/Bluetooth stereo alarm clock, USB charging station, ironing board and iron, hairdryer, and bed linens. Fresh towels are available daily and Wi-Fi and cable are included. 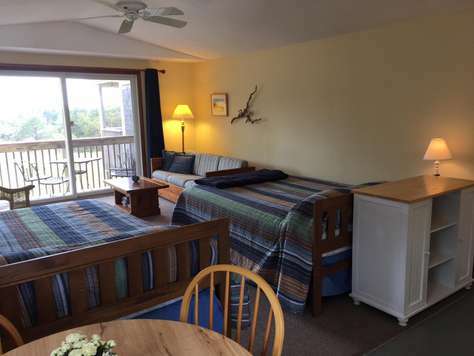 Unit 3 is ideally located just a few steps from the outdoor pool and comfortably sleeps a maximum of four on your choice of a queen bed, a full pull-out sofa bed, or a set of twin bunk beds. For our young and young-at-heart guests who enjoy the view from the top bunk, a sturdy access ladder and detachable safety guardrail are provided. The Braemar Resort Condominiums is on the Provincetown shuttle bus route and offers an on-site property manager, an outdoor pool, a large yard, several BBQ/picnic areas, and is a short distance from many beautiful beaches, bike trails, golfing, fishing, and historical landmarks. Newly updated with hardwood flooring and cool enjoyable A/C and heat. Free WiFi, toaster oven, two burner range top, coffee maker, microwave, blender, full size refrigerator, flat screen TV with DVD, CD player, comfortable relaxing Queen Bed and Day Bed. Towels are provided, please bring the towels for beach and pool. Very clean and comfortable. Fully furnished. Ground level. Walk right out to the pool and barbecue area. Slider to private deck and spacious backyard. Close to the National Seashore, great Cape Cod beaches, bike trails, historic Highland Lighthouse and golf course. Easily stroll Provincetown. Enjoy your wonderful vacation time in unit 5. Bright, breezy second floor studio apartment. Enjoy coffee, lunch, dinner on private deck with view of Cape Cod Bay and grassy backyard. Sleeps two on queen size bed. Comes complete with linens, kitchenette, pots, pans, apartment size refrigerator, tub, cable, flat screen TV, DVD, BBQ's and pool. Complimentary WIFI. Fresh towels are available, please bring towels for the beach and pool. Knowledgeable on-site manager for assistance with area and apartment. 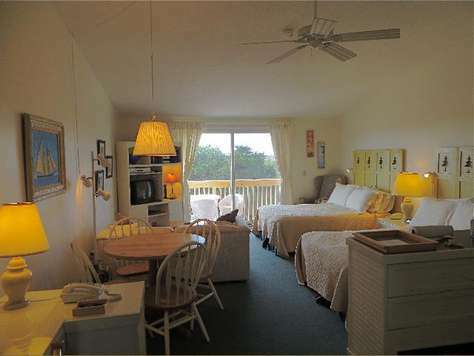 Close to P'town, Bay and ocean beaches and the National Seashore Park. Convenient shuttle bus stops in front of condo. Centrally located. Montano's Italian restaurant around the corner. Truro Vineyards, Highland Golf course, Atlantic Spice Shop all close by. Relaxed and quiet atmosphere. Relax in our comfortable and recently renovated efficiency condominium. This clean and sunny ground floor unit has wood flooring, sliders to a private deck and spacious grassy picnic BBQ and play area off the back patio, A/C, heat, a flat screen HD cable TV and DVD player, and bathroom with shower and tub. This unit has a very comfortable queen-sized bed, plus twin bunk beds (top bunk has safety bar). It is equipped with linens and cooking utensils. Fresh bath and kitchen towels are available daily. Kids and adults will enjoy the pool – steps away! Please bring towels for the beach and pool. The Braemar condominiums are individually owned. Each unit is unique! Professional management is onsite. Conveniently located on Route 6A in North Truro, Massachusetts, a short distance from the world’s best beaches, bike trails, Cape Cod light and all the shopping and restaurants that Provincetown has to offer. Bring your family, friends or just yourself to enjoy this quiet, relaxing vacation escape. Unhook from the day to day - appreciate the Cape’s fresh air, fresh scents -recapture your Self! Sliders to deck - enjoy morning coffee and afternoon cocktails. All tile with area rugs. Color cable TV- unit has queenn sized bed & day bed, full bath with tub/shower. Pool 20 yds away. Outfitted with cookware & utensils, cook-top, full sized microwave & fridge. Fresh towels available, please bring towels for pool. parking in front of units. Conveniently located on Route 6A in North Truro, Massachusetts a short distance from beaches, bike trails, Cape Cod light and Provincetown. A quiet, relaxing vacation escape. 2nd Floor Efficiency. Water views from deck! 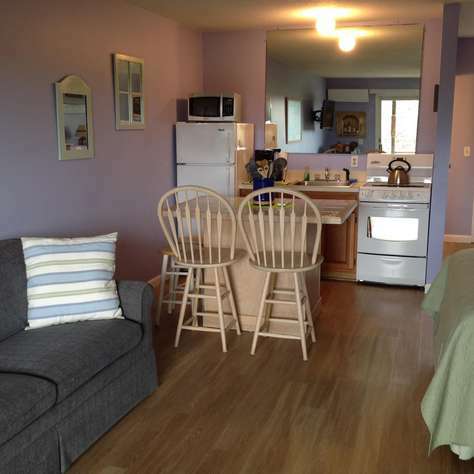 Relax in our comfortable recently renovated efficiency condominium. This 2nd floor unit has hardwood flooring, carpeting, sliders to deck, heat, color cable TV and bathroom with tub/shower. This unit has a queen-size bed. It is equipped with linens, cooking utensils, a cook-top and full size fridge. Fresh towels are available, please bring towels for the beach and pool. This conveniently located fully equipped first floor efficiency in North Truro is a 5 minute drive to Coast Guard Beach, voted one of the 10 best beaches in the USA. Even closer is life guard protected CCNS Head of the Meadow Beach and the adjacent town beach. On the Bay side, it is also 5 minutes to the calm and beautiful Cold Storage Beach. Highland Light is 5 minutes away. Parking for the unit is 3 feet from the door. A shuttle bus to and from Provincetown stops at the resort twice an hour during the season and makes all stops along the way. The unit has a stove top oven, microwave, and a double burner, refrigerator, counter top eating, a queen size bed, bunk beds with child guard, all bedbug proof, futon couch, full bathroom and dresser for long term stay clothing storage. Office will supply all towels, please bring towels for the beach and pool. There is a picnic area where children can play safely out back, a pool out front. It's a quiet beautiful place. Relax in our comfortable and sunny efficiency condominium. This 2nd floor unit has wall-to-wall carpeting, sliders to deck, heat, color cable TV and bathroom with tub/shower. This unit has a queen-size bed.. It is equipped with linens and cooking utensils. Fresh towels are available, please bring towels for the beach and pool . Relax in our comfortable condominium. This ground floor freshly painted unit has tile flooring and carpeting, sliders to deck, heat, color cable TV and bathroom with tub/shower. This unit has a queen-size bed and set of bunk beds. It is equipped with linens, cooking utensils. a cook-top and full-size fridge. Fresh towels are available, please bring towels for the beach and pool. with beautiful distant views of Cape Cod Bay. The Braemar condominiums are individually owned. Each unit is unique! This two bed two bath condominium at Braemar offers both space and privacy for 2 to 4 adults. Each bedroom has a queen size bed, cable tv, closet, and private full bath. A hallway leads to a bright open plan space with a fully equipped kitchen that includes an eight foot island counter, dining and social area, and flat screen tv with dvd player. This area offers beautiful distant views of cape cod bay through the sliding door that opens to a large private deck set up for morning coffee, dining, or just relaxing. Plenty of windows invite cape cod's ocean breezes and unique quality of light. 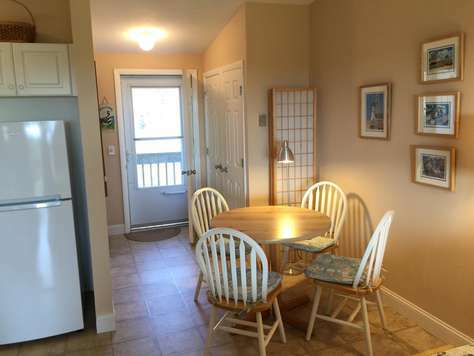 The kitchen is equipped with large refrigerator/freezer/ice maker, dishwasher, stove, microwave, toaster, coffee maker, blender, as well as plenty of dinnerware and utensils, including the traditional lobster pot. Five minutes to Provincetown and fifteen to Wellfleet offers easy access to dining, galleries, fine crafts, unique shopping, historic homes, whale watch/sailing/fishing charters, museums, concerts, a winery, drive-in theatre, hiking and biking through forest and dunes, miles of unspoiled bay and ocean beaches, and so much more. Located on the "Flex Shuttle Bus" route, means no need to drive and park in Provincetown as well as many beach destinations. You can be picked up and dropped off right in front of the unit! And don't forget to make time and enjoy the "park-like" open space at Braemar with picnic tables, grills, and the decked out swimming pool. Fresh towels are provided, please bring towels for the beach and pool. Enjoy! 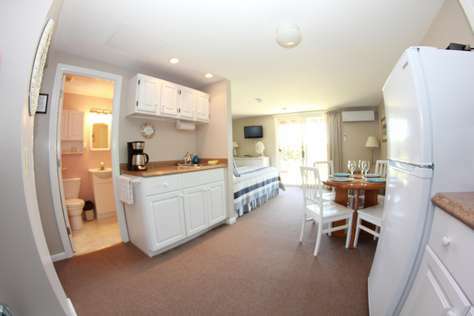 The Braemar Unit 20 has the look of Old Cape Cod with all the amenities of a 21st century vacation condo. The second floor unit has a cathedral ceiling with a large fan that keeps the unit comfortable all summer. With the sliders open there is excellent cross-ventilation, unit also has A/C and heat. There are 2 double beds that will sleep 4 and there is a pull-out sofa for an additional child. In the kitchen, besides the full-size stove and refrigerator, there is a coffee maker, blender, toaster and microwave with everything necessary to prepare a full meal and serve it inside or on the deck; with a great view over the meadow and Cape Cod Bay. The tile bath has a tub/shower and there is plenty of room to store all your belongings in the entrance area. There is a phone for making local calls, TV, stereo, DVD player and of course free Wi-fi for all your entertainment needs. Ground floor deluxe efficiency unit with private deck overlooking spacious backyard with BBQ grills. 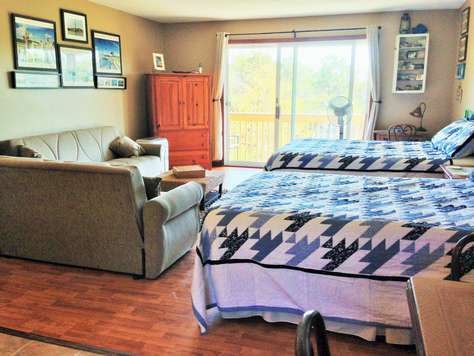 Updated unit with 2 full beds, full bath and fully equipped kitchen. All you need are clothes and your toothbrush. This unit has reverse cycle A/C and heat, new hardwood flooring and stove, large flat screen TV that can be viewed from beds, couch, kitchen and even the private deck. Fresh towels are provided, please bring towels for the beach and pool. Harmony Hill, as we like to call our unit, is clean, light and airy. The two queen beds are very comfortable and there is also a pull out couch. There are three bureaus to hold your things, closet space, coffee table, and a dining table with four chairs. There is a flat screen Hi-def TV, DVD player, CD player and radio for your entertainment. The kitchen is fully equipped for cooking, a coffee maker, microwave, blender, and a toaster. The bathroom has a tub/shower. The small deck with table, chairs and a small charcoal grill leads out to the lovely tree lined open grassy grounds. For those hot summer days, the Ceiling Fan, extra tall Portable Fan or A/C provide cool comfort. Fresh towels are provided, please bring towels for the pool and beach. Come, relax and enjoy the outer cape! Relax in our comfortable deluxe efficiency condominium. This 2nd floor end unit has hardwood floors, 2 set of sliders to deck, heat, color cable TV and bathroom with tub/shower. This unit has 2 full beds and a futon.. It is equipped with linens and cooking utensils. Fresh towels are available, please bring towels for the beach and pool. 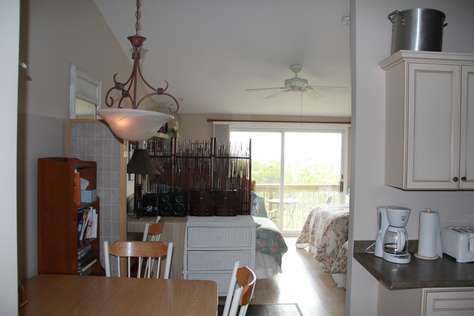 Extremely bright and sunny 1st floor end unit with wraparound deck. Two sets of sliders access large deck with dining set, 2 chaise lounge and 2 wicker chairs. Condo is newly renovated with hardwood floors, split AC System, granite top bathroom vanity, plenty of storage and fully stocked kitchen with full size frig/freezer. New queen size bed, full size futon/sofa and 4 comfy chairs for relaxing or reading. Flat screen HD TV, DVD and stereo, free WIFI, room darkener curtains, charcoal grills and fresh towels daily. In-ground pool, plenty of parking and on the PTown trolley route. Onsite management should any issues arise during your stay. Conveniently located on Route 6A in North Truro, Massachusetts a short distance from beaches, bike trails, Cape Cod light and Provincetown. A quiet, relaxing vacation escape. 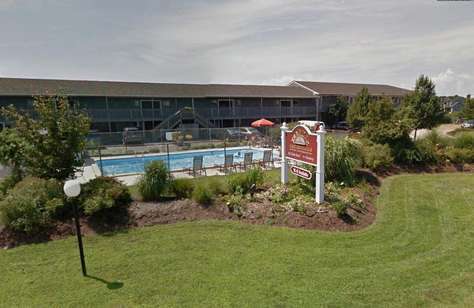 Large first floor studio at Braemar condominium in North Truro near pool and office offering fully equipped kitchen with full sized refrigerator, stove with oven and microwave; central ac, and sliders to patio and lawn area featuring picnic tables and barbecue grills. Newly renovated this year with wood and tile floors. Flat screen TV with DVD player.Two full size beds with memory foam and full-sized sleep sofa sleeps 4 comfortably also a walk in shower. Beautiful pool area and grounds, walking distance to town beach and short drive to beautiful National Seashore beaches. Two miles from Provincetown! Short walk to the beach! Newly renovated bright and spacious ground floor studio with air conditioning. Comfortably sleeps six. Walk out onto private patio and into spacious back yard with BBQ grills and picnic tables. Amenities include air conditioning, heat, and fully equipped kitchen with granite counter tops. Microwave, full size stove and refrigerator. Full bathroom, tub with shower. Two queen beds with new mattresses for the 2016 season and sleep sofa. Comfortably sleeps six. Free Wi-Fi and cable television. Fresh towels are available, please bring towels for the beach and pool. Ample parking. Swimming pool on site. Enjoy your vacation here! Amenities includeA/C, New Flat screen TV refrigerator, electric stove, microwave oven, Cuisinart blender, coffee maker, coffee grinder and toaster as well as hair dryer, iron with tabletop ironing board and kitchen table for four adults. Fresh towels are available, please bring towels for the beach and pool. Spacious 2nd Floor deluxe unit with an elevated ceiling. All newly furnished. Lovely water view of Cape Cod Bay. 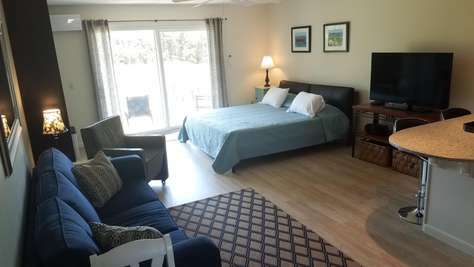 Amenities include A/C, heat, flat screen HD TV with cable, free WIFI, refrigerator and freezer, sofa, ceiling fan, rugs, hardwood floors, iron/ironing board , hairdryer, tub w/shower, queen and full beds. Dining, sleeping and living areas, private balcony overlooking bay and plenty of parking.Swimming Pool. Fresh towels are available, please bring towels for the beach and pool. Large Studio, Private Deck with wonderful view . Quiet location at end of building. New flooring, heated if needed, air conditioned, color cable TV, full bath with tub and shower. One queen size bed, one queen pull out sofa ( memory foam mattress). Pull out twin size bed with memory foam topper. All linens and cooking utensils provided. Fresh towels are available, please bring towels for the beach and pool. Beautiful swimming pool. Just a half mile down the road is beautiful Beach Point on the Bay for swimming, sunning, snorkeling, windsurfing and sailing. Thirty miles of unspoiled ocean beaches in the National Seashore Park surround the area and Truro’s own magnificent Highland Beach is just minutes from The Braemar. The Braemar is in a setting as relaxing or active as you desire. Bask in the sun at our outdoor pool or simply relax on your private deck. The Braemar offers visitors to Cape Cod a comfortable alternative to the congestion in town… offering ample parking and oversized quarters. No smoking please & No Pets allowed per the management. This deluxe Studio Apartment offers easy garden level access. Inside you'll find a completely renovated and fully equipped kitchen with s.s. refrigerator, quartz counter tops, and bar seating. The open plan living area has a large 52" HDTV, Queen size sleeper sofa with new memory foam matress, and convenient charging station for phone, ipad. WIFI is available throughout the complex. There is a king size bed with new memory foam mattress and comfortable padded leather backrest. There's also plenty of drawer and hanging space inside a large double wardrobe. A full bath with tub/shower unit, heat lamp, and new flooring is simple and clean. Fresh towels are available, please bring towels for the beach and pool. Step outside through the sliding glass doors to a private patio with seating area and dinette. Enjoy beautiful sunsets overlooking an expansive lawn surrounded by pines. Additionally there is a picnic area with picnic table and grill, and a beautifully landscaped swimming pool and lounge area out front for your enjoyment. The Braemar is perfectly located minutes to charming North Truro Village, Truro Vineyards, and Bay and Oceanside beaches. Provincetown and Wellfleet are also just a few miles away. Close to everything, on the shuttle line, activities abound. Yoga on the beach, hike, bike, parasail, kayak, whale watch, gallery hop, bar hop, shop, free beach concerts/fires on the beach, or tranquil meditation in the dunes...do more of what makes you happy! No Pets allowed on the property there will be fees added to you bill if this rule is violated! !No Pets allowed on the property there will be fees added to you bill if this rule is violated!! Relax in our spacious 2nd floor studio condo. Quiet location at end of building. Wall-to-wall carpeting, heated if needed, ceiling fan, air conditioned with a portable floor unit, color cable TV, full bath with tub and shower. Two queen-sized beds. All linens and cooking utensils provided. Fresh towels are available, please bring towels for the beach and pool. . No maid service. Beautiful swimming pool. Spacious 2nd Floor deluxe unit with an elevated ceiling. Newly renovated! Lovely water view of Cape Cod Bay. Amenities include A/C, heat, flat screen HD TV with cable, free WIFI, refrigerator and freezer, sofa, ceiling fan, rugs, hardwood floors, iron/ironing board , hairdryer, walk in shower, queen beds with new mattresses. Dining, sleeping and living areas, private balcony overlooking bay and plenty of parking.Swimming Pool. Fresh towels are available, please bring towels for the beach and pool. Two miles to Provincetown. Short walk to beach. Ample parking. Swimming pool on site. This 2nd floor condo unit was completely renovated a few years ago. It has a full kitchen, wood and glass cabinets, dishwasher and refrigerator. All kitchen utensils are provided. It is large, comfortable, quaint and cozy with 2 full size beds and one single bed. It also has an outdoor patio area where you can eat breakfast or sit outside on a starry night. Enjoy beautiful views of Cape Cod Bay in the distance. My condo is in North Truro. 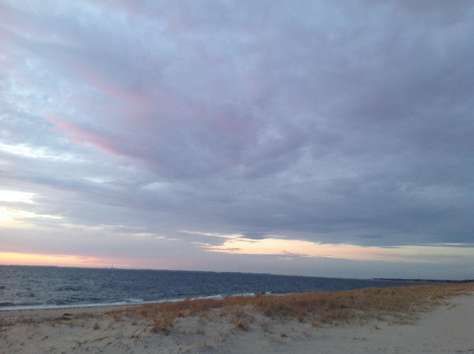 It sits between Wellfleet and Provincetown. both towns have lots to do. There are all kinds of diverse shops as well as restaurants and beach areas. I think you will enjoy a wonderful vacation in this little bit of heaven. Ground level deluxe condo sleeps 4, fully equipped kitchen, full bath with tub/shower. Sliders open to deck overlooking grassy backyard with BBQ grills or walk out your front door to pool and grassy area with picnic tables and BBQ grills.